Children love to spend time outside. Their brains and bodies need it. They thrive on running off all that energy and getting that fresh air and sunshine. The perfect way to do it is a tricycle, bike, or scooter outside! smarTrike has the perfect tricycle for kids ages 10m-3y. 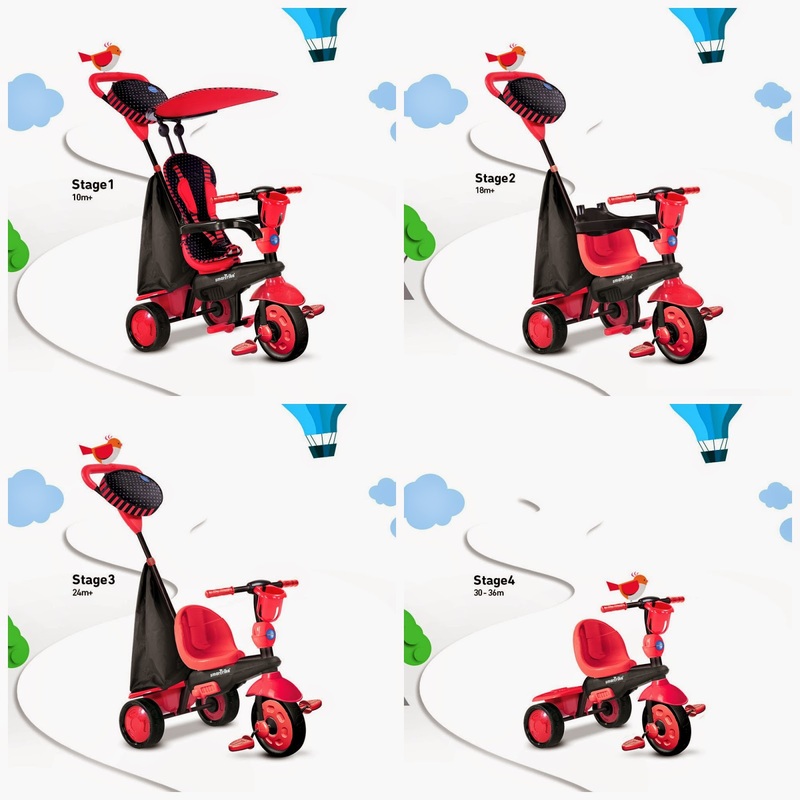 They are 4-in-1 tricycles that develop and transform with your child depending on their age. This is also something that's great for multiple children. With a quick simple little change, each child can be on their way. I really like the adult handlebar on the back for kids that are too little to pedal the trike themselves. smarTrike has quite a few different models to choose from, but all are for the same ages. The one pictured above is the Spark Touch Steering 4-in-1 trike. It comes in 4 colors (red, blue, green and black), and also comes with a storage bag. smarTrike has a top technology. It is just like steering a stroller and makes it for a smooth push when you're pushing your child in it. It also features a bottle holder, high back support padded seat, foldable footrest, sun protective canopy and many more great features. They currently have 8 trike models for sale. But their site goes beyond that. They also have Running Bikes (not currently sold in the US) and a bike called the Springo as well that will be available later in 2015. So they aren't just trikes, even though that's what they specialize in. The products are sold in 70 countries worldwide! So these are not going to be hard to find! They are everywhere. Here in the US they are sold at Toys R Us, Babies R Us and Amazon. *Disclaimer, I received compensation to write this post, but all opinions are 100% my own. Hello! This is such a cool idea! I really like that it "grows" with the child and that they're getting exercise from it. So many children have powered ride-ons now. (Including my grandson.) Thank-you for the information & review! I like this cycle and Its looking really cool one. This is a fantastic product! I remember buying different kiddie rides throughout the stages of my daughter's adolescence. It would have been nice to have a tricycle that could be converted so she can use it for many years. Would refer smarTrike to my friends. Thanks for sharing!